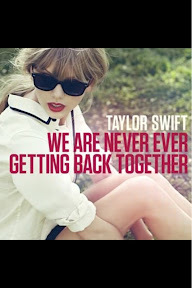 I could not be more excited to wake up to a new Taylor Swift single this morning!! Album "Red" due out October 22nd, HOLLA!!! So what if I am 30 years old and love Taylor Swift and Justin Bieber? Judge away, I'll be over here dancing and singing my heart out! We are talking about the richest, most successful people under 30, at 22 and 18 years old. Hate it or love it, it is what it is. I really connected with Tay-Tay (as she is referred to in our house) over "Teardrops on My Guitar". Let's just say I was going through it at that time and I may or may not have cried in my car when it would come on...every.single.time. I enjoy the fact that she pulls inspiration from her relationships but is classy enough to never name names. Because let's be honest, we have all had relationship woes. And when you do, those songs that really encompass everything you felt or wanted to say, you immediately love that artist. Why do you think people love Adele so much? For me, it's Taylor and Kelly Clarkson. But alas, haters gon' hate. Whateva, whateva, I do what I want! I will keep buying their singles and albums and singing their songs at the top of my lungs in my car and shower. Who is/are your guilty pleasure artist(s)?